There were a few exhibition booths at the conference venue. 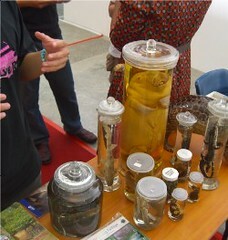 This one from the Raffles Museum of Biodiversity and Research (they're based at the NUS campus) got my attention. 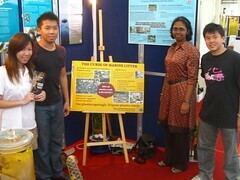 The four young people in the photo were NUS students (the Toddycats Public Exhibitions team, to be precise), who volunteered to man the booth. 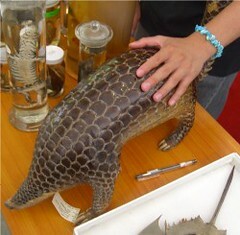 Incidentally, "Toddycat" is another term for the Common Palm Civet (here's a live wild specimen at Pulau Ubin). The chap on the extreme left, Alvin Justin, gave me a quick tour of their exhibits. 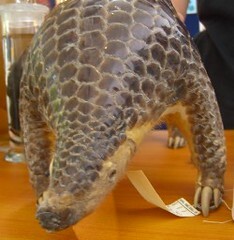 There was a pangolin specimen. Alvin Justin explained how most people were surprised at the natural gloss of the scales. Alvin Justin asked if I knew what this was. I said "Horseshoe Crab" and added that it was considered a living fossil (Nature documentaries were one of my favourite shows when younger). "Ah, but do you know how it looks like underneath?" asked the young Toddycat guide. He flipped it over and yeah, I was surprised to see how skinny it was. He went on: "Most people may know that it's a living fossil, but few are aware that it's related more to spiders than crabs". And I became acutely aware of the relevance of the educator, standing in front of the student. There are plenty of information sources out there. 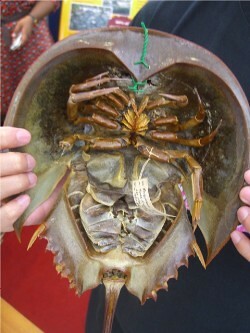 The fact that a Horseshoe Crab is more closely related to spiders than crabs is something mentioned in the first paragraph of this Wikipedia entry. One simply had to point the student to a few of such information links if all that's needed was to let them learn facts. Ah, but when a teacher weaves a story into the lesson. Or displays enthusiasm and passion (as Alvin Justin did). Think you mean Justin on the extreme right? Oh yes, my mistake. Corrected! Sorry to correct you but it is not manatee. 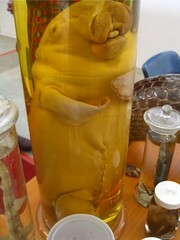 It is a Dugong. Different animal altogether. Me a toddycat too! Can change manatee to dugong. That's the regional species. The manateee from the America/West Africa. 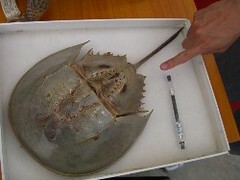 That specimen in the picture is from Singapore waters, from at least a century ago. OK, more corrections done. Yeah, JUSTIN (not Alvin, sorry dude) was telling me it's a Dugong. I got it mixed up.